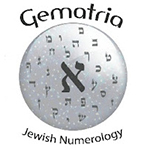 Gematria or gimatria is a system of assigning numerical value to a word or phrase, in the belief that words or phrases with identical numerical values bear some relation to each other, or bear some relation to the number itself as it may apply to a person’s age, the calendar year, or the like. It is likely that the term derives from the order of the Greek alphabet, gamma being the third letter of the Greek alphabet (gamma + tria). Alternatively, the word “gematria” is generally held to derive from Greek geōmetriā, “geometry”, which was used as a translation of gēmaṭriyā, though some scholars believe it to derive from Greek grammateia, rather; it’s possible that both words had an influence on the formation of the Hebrew word. It has been extant in English since the 17th century from translations of works by Giovanni Pico della Mirandola. Although ostensibly derived from Greek, it is largely used in Jewish texts, notably in those associated with the Kabbalah.